RootsPoint recently posted the Index to New York City Marriage Applications, Affidavits, and Licenses, 1908-1929. This collection is an index to marriage licenses filed at the New York City Clerk Offices from the five boroughs from 1908 to 1929. 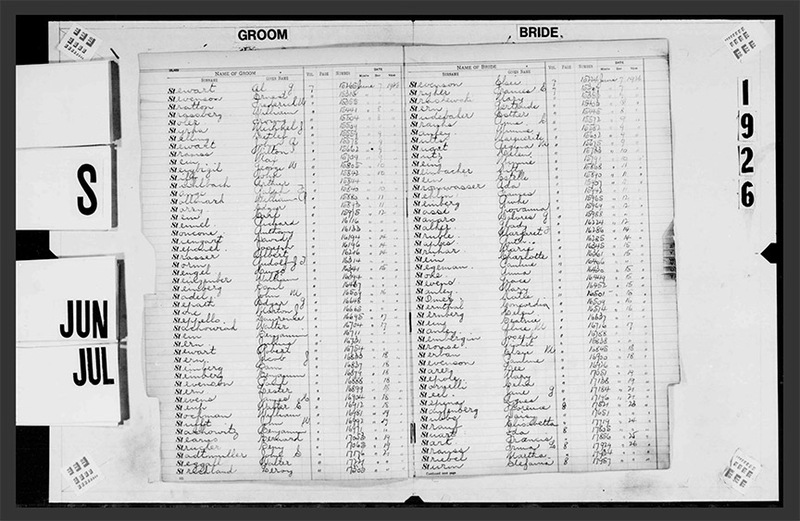 The index contains the given names and surnames of both the bride and the groom, the date of the license application, and the license number. The images to these records (48 reels of microfilm) were obtained by ReclaimtheRecords.org from the NYC Municipal Archives through a settlement after ReclaimtheRecords.org filed a legal petition in the Supreme Court of the State of New York, County of New York to obtain the “public” records. The collection contains 3,025,064 records. Brooke Schreier Ganz is the founder and president of Reclaim The Records, and the first genealogist to successfully sue a government archive for the return of records to the public. You can read more about the collection here.